Welcome to Week 6 of the ten-week New Year Health Challenge, courtesy of Christine Kling of Body Basics LLC in Boise ID. Though there has been recent research link heart benefits with alcohol consumption, the risks/dangers far outweigh the one benefit. Take a look for yourself. Calories. Since alcohol is caloric dense at 7 calories per gram, anyone interested in weight management must count these 7 calories per gram in their total intake. These calories can quickly add up! Low nutritional value. The high calories in alcohol are not converted into energy that can be used by your muscles; rather, alcohol is converted into fat. 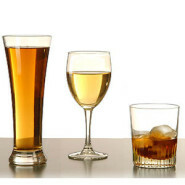 Alcohol is metabolized – or broken down – in the liver. When your body is breaking down alcohol, all other functions of the liver are secondary, including glucose production. Since your body needs glucose for energy, you may experience an energy lull as the liver works to expel the alcohol. If you have a glass of wine with dinner, your body will burn alcohol before calories. Poor muscle growth. Alcohol increases lactic acid production, hindering muscle recovery. Alcohol consumption prevents your body from absorbing important nutrients like thiamin, vitamin B12, folic acid and zinc. These nutrients help in the formation of new cells, boost your immune system and aid in the metabolism of proteins and fats. Sleep problems. 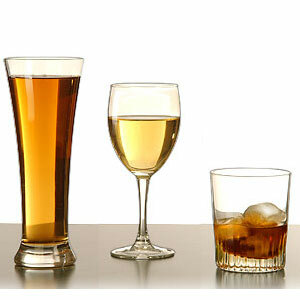 Alcohol can disrupt sleep patterns. Growth hormones which we need for muscle growth are released during deep sleep; therefore, disrupted sleep from alcohol can lead to slow muscle gain. Dehydration. Alcohol is not an effective beverage for replacing fluids. It actually causes fluid loss because alcohol acts as a diuretic. Your body’s water will go to the kidneys to metabolize the alcohol when it should be used to help process other substances. Related to Illnesses. Alcohol is linked to many serious illnesses, including liver disease, alcoholism, high blood pressure, obesity, stroke, breast cancer, brain damage, infertility, suicide and accidents. Current evidence suggests that moderate alcohol consumption is associated with a lower risk of heart disease in some people. It was found that one drink per day for women and one to two drinks a day for men can increase the level of high-density lipoproteins (HDL’s) in the blood. HDL’s are known as the “good cholesterol” and are responsible for keeping your arteries clear. It is not advisable to consume alcohol for the reason of reduced risk of heart disease because of all the negative effects associated with alcohol consumption. Plan in advance — Think about where you are going, who will be with you. Limit your intake and/or enjoy a fun replacement drink. Keep your drink festive, so that you won’t feel like you’re missing out (i.e. sparkling water with a lime or kefir). Eat before or while you are drinking — Eating slows down your drinking pace and fills you up. Consuming healthy carbohydrate and protein-rich foods following exercise helps replenish muscle fuel stores. Drink water — If you are thirsty, drink your water first! Drink slowly — Sip your drink, don’t gulp it down! Put your glass down between sips. Keep yourself busy — If you are occupied, you tend to drink less. Have a dance or play pool; do not just sit and drink. For every day you are alcohol free, you get a point! If you decide to drink, try to keep it to the recommended amount. You also get points each day if you drink enough water, sleep enough and cut out the sugar, exercise and eat a balanced breakfast. Total amount of points possible at end of week (not including BONUS) is 42.